Here’s another in a run of interviews with dedicated folks who put together independent comics shows in North America. 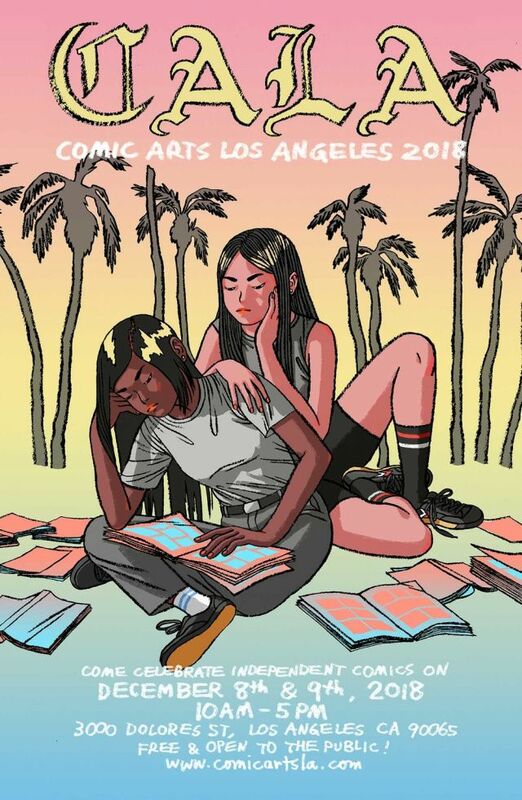 Los Angeles’ CALA is about to hold their fifth annual event, and guest ‘stud Kit Brash talked to two of the team behind it, Jen Wang and Jake Mumm, a couple of weeks after last year’s show. This year’s CALA will run on December 8th and 9th, from 10am til 5pm each day. Guests will include Taneka Stotts, Sophia Foster-Dimino, Marinaomi, Laura Lannes, Cathy G. Johnson, Landis Blair, Ezra Claytan Daniels, and Hartley Lin. The venue, a gymnasium at 3000 Dolores St in Glendale, has that common LA curse of being five times quicker by car than by public transport, but there’s parking onsite and in surrounding streets, with a food truck and tables to save precious table-browsing time. Entry is free, re-entry is probably because you had to hit the ATM and come back. All the details are at comicartsla.com.